If a method is marked async, nunit does not recognise it as a test, and some test runners may incorrectly pass it while it is still running. These methods actually return a Task not void, and the test can only be passed if the task completes without a failure. I believe this deserves implementing. Charlie, do you mind if I look into it? Anthony, although this is certainly currently not handled at all in NUnit, if I recall correctly R# emulates NUnit and doesn't use it directly, so I would say that your tests should first be run using an official NUnit runner, like the console or the gui, in order to validate this bug. stealing mode (no pun), which may also come into play in this scenario. > I believe this deserves implementing. > Charlie, do you mind if I look into it? > Developers, which is subscribed to NUnit V2. > can only be passed if the task completes without a failure. Hi Jv, sure, I was just proposing myself as a way to have this out soon, but I certainly don't mind if you would like to take over. No, not take over but help you with by pairing? > but I certainly don't mind if you would like to take over. I marked this triaged (since I know we don't have the feature) and assigned it to Simone. I'm also changing the bug to target NUnitLite and NUnit 3.0. NUnitLite currently has an experimental Asynchronous attribute, which allows other tests to be run while the marked test continues on a separate thread. Implementing this required a _lot_ of changes to how tests are executed, which is why I really don't think we should do it in the 2.6 series. Since NUnitLite is built for multiple platforms it would be relatively simple to support the use of an async method without requiring the attribute in the .NET 4.5 build - which you would have to add. NUnit 3.0 has a branch (currently not published) where all tests may be run in parallel. It's not yet clear to me whether we really need any special handling for async tests in this environment. On the one hand, a single async test would not have any impact on execution of other tests so long as the maximum number of runners was not exceeded. On the other hand, people are probably using async (at least some of the time) on methods that have to wait for long-running operations that don't use the cpu, so we might like the runner thread to be freed up for another test while that wait takes place. Between the two projects, I think that NUnitLite is the easiest place to begin since it's all in a single assembly. If you have to make changes to the basic execution of tests (found under framework\Internal\WorkItems) we will want to port the changes to NUnit 3.0 eventually as well. In fact, lot of new stuff has been first developed in NUnitLite over the years and then moved to NUnit. I upgraded NUnitLite fix to High priority because it would enable us to support async methods in the NUnit test adapter that runs under VS 2012. That adapter is currently based on the full NUnit framework, but I was planning to switch it over to NUnitLite as soon as the latter reached feature parity with NUnit. user I would like to not need to do. 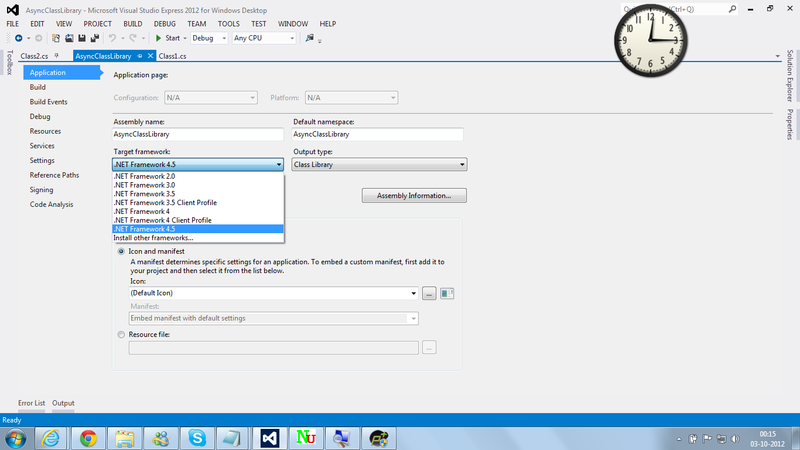 > support async methods in the NUnit test adapter that runs under VS 2012. > feature parity with NUnit. Simone is correct here. This is all about the Task type, which was present in C#4. It may be enough to allow tasks with this return type, wait for the task to complete and check for exceptions. This comment from Eric Lippert http://stackoverflow.com/a/8043882/5599 suggests that if the method returns "async void" then you can't get a task out of it. This is be a pity, since if you have the task you can wait for it to compete and then check for exceptions. I wonder how MSTest deals with that? I'm OK with your experimenting with this to see if something can be done. We can add NUnitV2 back to the affected projects if it turns out to be relatively simple: i.e. : if we don't have to change the basically sequential execution pattern that is implemented in NUnit 2.6. However, I did point out in the StackOverflow thread that there is lots you can already do in NUnit with asynchronous calls, provided you don't expect NUnit to recognize async tests. So long as the user does an await in the test, there won't be an issue as far as I can tell. Perhaps you should first check me on that. Since NUnit 2.x is built targeting .NET 2.0, I'm not sure how a Task return type would help us. Can you clarify? Frankly, I'd rather hurry up with NUnit 3.0 than spend time on a half-a**ed fix of NUnit 2.6. Since you can't await a method that returns async void, and since NUnit attaches a special meaning to any value that is returned by the test method, we'll have to somehow allow for that either by disallowing checking the return value on an async test method or awaiting the task and then checking the actual return value in some way. there then it's probably going to be easier by far. > sequential execution pattern that is implemented in NUnit 2.6. > should first check me on that. > return type would help us. Can you clarify? > half-a**ed fix of NUnit 2.6. I just came across this thread while searching for a way to run async tests with NUnit 2.6. Thanks for the pointer... interesting articles. any open source projects except those that also use MS-PL. > tests with NUnit 2.6. Based on Simone's work, I added this back to the NUnitV2 project, targeting the 2.6.2 release. Since I am fairly free, I can work on this issue independently as a spike. Please point me to the appropriate files in NUnit v2. I will be working on finding if the async threads' context can be independently established. This will help in maintaining that tests "await"-ing a async result is testing the right context and will also help in establishing the "void" context. than this if you want something of your own! > spike. Please point me to the appropriate files in NUnit v2. > testing the right context and will also help in establishing the "void"
> than this if you want something of your own! > > spike. Please point me to the appropriate files in NUnit v2. > > testing the right context and will also help in establishing the "void"
> > Extended Testing Platform. of examples but of course none of them can use async. > merged with Simone's work. >> than this if you want something of your own! >> > spike. Please point me to the appropriate files in NUnit v2. >> > testing the right context and will also help in establishing the "void"
>> > Extended Testing Platform. >> Developers, which is subscribed to NUnit V2. >> can only be passed if the task completes without a failure. description of the merge request for details. a look at how it would make sense to handle it. Hello, I've pushed the changes to a new branch, please have a look at the description of the merge request for details. Charlie, I didn't take any decision with regards to how to handle solution projects built for fx > 2.0 so in order to run the build you need to have 4.5 and specify net-4.0 as the target via nant (apparently it still doesn't explicitly support .NET 4.5). I guess it would make sense to put some conditionals in the build scripts, but it's a bit confusing, specifically because this feature is available also for the net-2.0 build so it would make sense to run its tests even in that case, but then I'm not sure how you could build the test assembly if you have specified the net-2.0/3.5 targets, as the build will fail. Maybe an override specifically for that project? I kept the changes in that regard to the minimum so you have have a look at how it would make sense to handle it. may not help my cause today, it seems. > of examples but of course none of them can use async. > > merged with Simone's work. > >> than this if you want something of your own! > >> > spike. Please point me to the appropriate files in NUnit v2. > >> > independently established. > >> > Extended Testing Platform. > >> Developers, which is subscribed to NUnit V2. > >> can only be passed if the task completes without a failure. I didn't find any way to make any test fail yet. > may not help my cause today, it seems. > > of examples but of course none of them can use async. > > > merged with Simone's work. > > >> than this if you want something of your own! > > >> > spike. Please point me to the appropriate files in NUnit v2. > > >> > independently established. > > >> > context. > > >> > Extended Testing Platform. > > >> Developers, which is subscribed to NUnit V2. @Charlie: You're right, task return type only helps if you are targeting .Net 4.0 or up. > .Net 4.0 or up. > I didn't find any way to make any test fail yet. > > Ok, will do. > > may not help my cause today, it seems. > > > of examples but of course none of them can use async. > > > > merged with Simone's work. > > > >> than this if you want something of your own! > > > >> > spike. Please point me to the appropriate files in NUnit v2. > > > >> > independently established. > > > >> > context. > > > >> > Extended Testing Platform. they could feature in the help section. IsServerGC call from the unmanaged app. Is this consideration important? should NUnit provide a hint when the Async tests are run or executed? comment on this with reference to #2 above. be built from the source, which is what the above steps do. I'd say that GC modes have nothing to do with this though. > they could feature in the help section. > feature in .Net 4.5. > IsServerGC call from the unmanaged app. Is this consideration important? > should NUnit provide a hint when the Async tests are run or executed? > comment on this with reference to #2 above. >> of examples but of course none of them can use async. >> > merged with Simone's work. >> >> than this if you want something of your own! >> >> > spike. Please point me to the appropriate files in NUnit v2. >> >> > independently established. since it will be required by you later, I guess. with the .core dlls built of Simone's branch. A question though. Is it necessary for the Test method to be marked Async? method to not be Async ? > a problem for you? > > 1. Will start with the scenarios outlined by you plus some of my own. > > they could feature in the help section. > > feature in .Net 4.5. > > IsServerGC call from the unmanaged app. Is this consideration important? > > should NUnit provide a hint when the Async tests are run or executed? > > comment on this with reference to #2 above. > >> of examples but of course none of them can use async. Is not the branch pull-ed by me not visible in the lp log? > >> > merged with Simone's work. > >> >> than this if you want something of your own! not as far as I know. :-) Perhaps the LP guys can. > Is not the branch pull-ed by me not visible in the lp log? >> a problem for you? >> > 1. Will start with the scenarios outlined by you plus some of my own. >> > they could feature in the help section. >> > feature in .Net 4.5. >> > IsServerGC call from the unmanaged app. Is this consideration important? >> > should NUnit provide a hint when the Async tests are run or executed? >> > comment on this with reference to #2 above. >> >> of examples but of course none of them can use async. >> >> > merged with Simone's work. > since it will be required by you later, I guess. No, that won't be required and won't even work I'm afraid. First, NUnit V2 will never be built for .NET 4.5. That's what 3.0 is for. used reflection to do it and has not used any 4.5 features. > with the .core dlls built of Simone's branch. > A question though. Is it necessary for the Test method to be marked Async? > method to not be Async ? what help it can be from your perspective. 2.0? Sorry if this is a stupid question. > > No problems. Branched Simone's three times for different reasons/tests. > > since it will be required by you later, I guess. > No, that won't be required and won't even work I'm afraid. > used reflection to do it and has not used any 4.5 features. > when you build NUnit? > > with the .core dlls built of Simone's branch. > > method to not be Async ? > >> a problem for you? > >> > 1. Will start with the scenarios outlined by you plus some of my own. > >> > they could feature in the help section. > >> > feature in .Net 4.5.
some of them are limited in what they support. of #if statements, which keep it from being compiled when not wanted. > what help it can be from your perspective. > 2.0? Sorry if this is a stupid question. >> > No problems. Branched Simone's three times for different reasons/tests. >> > since it will be required by you later, I guess. >> No, that won't be required and won't even work I'm afraid. >> used reflection to do it and has not used any 4.5 features. >> when you build NUnit? >> > with the .core dlls built of Simone's branch. >> > method to not be Async ? >> >> a problem for you? >> >> > 1. Will start with the scenarios outlined by you plus some of my own. >> >> > they could feature in the help section. course it will use an agent to run tests built for CLR > 2.
because it tries to build the .NET 4.5 test assembly. they don't show up as ignored. > some of them are limited in what they support. > of #if statements, which keep it from being compiled when not wanted. > > what help it can be from your perspective. > > 2.0? Sorry if this is a stupid question. > >> > since it will be required by you later, I guess. > >> No, that won't be required and won't even work I'm afraid. > course it will use an agent to run tests built for CLR > 2. > because it tries to build the .NET 4.5 test assembly. NUnit 3.0. :-) But never mind... you convinced me. > they don't show up as ignored. it's used by other tests, just pick any class there and find references. >> some of them are limited in what they support. >> of #if statements, which keep it from being compiled when not wanted. >> > what help it can be from your perspective. >> > 2.0? Sorry if this is a stupid question. > > course it will use an agent to run tests built for CLR > 2. > > because it tries to build the .NET 4.5 test assembly. > NUnit 3.0. :-) But never mind... you convinced me. > > this with Charlie. Ah cool, I'll start by adding 4.5 to the whole build script system then. > > they don't show up as ignored. > it's used by other tests, just pick any class there and find references. > >> some of them are limited in what they support. > >> just a set of tests, not NUnit. It is of course built for .NET 4.5. > >> of #if statements, which keep it from being compiled when not wanted. >> > course it will use an agent to run tests built for CLR > 2. >> > because it tries to build the .NET 4.5 test assembly. >> NUnit 3.0. :-) But never mind... you convinced me. > and I'll do the rest. it messed up C++ compilation under VS2010 - also had to reapply VS2010 SP1. commands to allow you to run tests across different .NET versions. >> > this with Charlie. > Ah cool, I'll start by adding 4.5 to the whole build script system then. I'm in the process of adding it to the NUnitLite script myself. >> > they don't show up as ignored. >> it's used by other tests, just pick any class there and find references. go ahead with the other scenarios. > >> > course it will use an agent to run tests built for CLR > 2. > >> > because it tries to build the .NET 4.5 test assembly. > >> NUnit 3.0. :-) But never mind... you convinced me. > > and I'll do the rest. > it messed up C++ compilation under VS2010 - also had to reapply VS2010 SP1. > commands to allow you to run tests across different .NET versions. > >> > this with Charlie. > > Ah cool, I'll start by adding 4.5 to the whole build script system then. > I'm in the process of adding it to the NUnitLite script myself. same but it does not test a void return value. > go ahead with the other scenarios. >> >> > course it will use an agent to run tests built for CLR > 2. >> >> > because it tries to build the .NET 4.5 test assembly. >> >> NUnit 3.0. :-) But never mind... you convinced me. >> > and I'll do the rest. >> commands to allow you to run tests across different .NET versions. >> >> > this with Charlie. >> > Ah cool, I'll start by adding 4.5 to the whole build script system then. variable, you are asserting that a Task<int?> is equal to a int? > same but it does not test a void return value. > > go ahead with the other scenarios. > > targeted test. Thanks. > >> >> > course it will use an agent to run tests built for CLR > 2. > >> >> > because it tries to build the .NET 4.5 test assembly. > >> >> > built. > >> >> NUnit 3.0. :-) But never mind... you convinced me. > >> > and I'll do the rest. Yes, it compiles alright. That is not my concern. source by running NUnit on target 2.0 but use the .net 4.5 assembly. > variable, you are asserting that a Task<int?> is equal to a int? > > same but it does not test a void return value. > > > go ahead with the other scenarios. > > > targeted test. Thanks. > > >> >> > course it will use an agent to run tests built for CLR > 2. > > >> >> > because it tries to build the .NET 4.5 test assembly. > > >> >> > built. It seems like this bug is getting crowded with general discussion of async. Let's only post to the bug when we're talking about the bug from now on. The test is "will this be helpful to folks checking the bug?" >> variable, you are asserting that a Task<int?> is equal to a int? >> > same but it does not test a void return value. >> > > go ahead with the other scenarios. >> > > targeted test. Thanks. >> > >> >> > course it will use an agent to run tests built for CLR > 2. >> > >> >> > because it tries to build the .NET 4.5 test assembly. Hi Charlie, I've committed some changes regarding the build scripts mainly. assembly in addition to all the others, without any "runtimeFramework"
it's not itself built for 4.5 but the test assemblies are there. out what I did exactly. An observation related to tests from the user perspective only. The "async"
expression that will allow an async test to await the expression result. > Let's only post to the bug when we're talking about the bug from now on. > The test is "will this be helpful to folks checking the bug?" > >> variable, you are asserting that a Task<int?> is equal to a int? > >> - even if you await on ob.TaskMethod() so that you get back an int? > >> > same but it does not test a void return value. > >> > > Attached is a test for checking the thread id of the task running. > >> > > go ahead with the other scenarios. > >> > > targeted test. Thanks. > Hi Charlie, I've committed some changes regarding the build scripts mainly. > assembly in addition to all the others, without any "runtimeFramework"
> it's not itself built for 4.5 but the test assemblies are there. > right now in V2. > out what I did exactly. That idea introduces asynchronous processing, which would be a new feature. test to finish, so that only one test runs at a time, even if marked async. For more than that, see NUnitLite or wait for NUnit 3.0! > An observation related to tests from the user perspective only. The "async"
> expression that will allow an async test to await the expression result. >> Let's only post to the bug when we're talking about the bug from now on. >> The test is "will this be helpful to folks checking the bug?" >> >> variable, you are asserting that a Task<int?> is equal to a int? >> >> - even if you await on ob.TaskMethod() so that you get back an int? >> >> > same but it does not test a void return value. >> >> > > Attached is a test for checking the thread id of the task running. >> >> > > go ahead with the other scenarios. > meetings I'm preparing for. > compiled with .NET 2.0. > > assembly in addition to all the others, without any "runtimeFramework"
> > it's not itself built for 4.5 but the test assemblies are there. > > right now in V2. > > out what I did exactly. that I could test a few simple scenarios. > That idea introduces asynchronous processing, which would be a new feature. > test to finish, so that only one test runs at a time, even if marked async. > For more than that, see NUnitLite or wait for NUnit 3.0! > > expression that will allow an async test to await the expression result. > >> Let's only post to the bug when we're talking about the bug from now on. > >> The test is "will this be helpful to folks checking the bug?" > >> >> variable, you are asserting that a Task<int?> is equal to a int? > >> >> > same but it does not test a void return value. branch which will do what you want. You can pull, build and use it. > that I could test a few simple scenarios. >> That idea introduces asynchronous processing, which would be a new feature. >> test to finish, so that only one test runs at a time, even if marked async. >> For more than that, see NUnitLite or wait for NUnit 3.0! >> > expression that will allow an async test to await the expression result. >> >> Let's only post to the bug when we're talking about the bug from now on. >> >> The test is "will this be helpful to folks checking the bug?" >> >> >> variable, you are asserting that a Task<int?> is equal to a int? sending in the examples. Tell me how to put them on the wiki. > branch which will do what you want. You can pull, build and use it. > > that I could test a few simple scenarios. > >> For more than that, see NUnitLite or wait for NUnit 3.0! > >> > Yes, sure. > >> >> The test is "will this be helpful to folks checking the bug?" > >> >> >> - the test will nonetheless pass because the two integers? Thought it might be of interest and illuminative for some ! 1) Tell us what version of NUnit you used to reproduce it. that will reproduce the bug. 3) Tell us what you think NUnit should do instead of what it's doing. in NUnit. If it were a bug in NUnit obviously it would have passed. the "pre-bug fix" scenario of a test passing regardless. picture)that will reproduce the bug. provides the mechanism to test it, too! >> 3) Tell us what you think NUnit should do instead of what it's doing. tests prove that NUnit is functioning correctly despite the buggy code. > 1) Tell us what version of NUnit you used to reproduce it. > that will reproduce the bug. > 3) Tell us what you think NUnit should do instead of what it's doing. sent you the corrected one instead. within an *async task method*.